Dan Kent is a writer and co founder of Stocktrades.ca. A DIY investor for 8 years now, Dan has a combination of dividend, growth and real estate investments in to his portfolio and is looking to continually grow his net worth. You can check his website out at stocktrades.ca or follow him on Twitter at @Stocktrades_CA. So You Wanna Start Buying Stocks? Investing is absolutely crucial in today’s society. With skyrocketing housing prices and an ever increasing cost of living, you simply can’t save your way to retirement. The problem with investing to those who don’t know much about it, is it is scary as hell. The stock market is filled with nonsensical jargon, terms that you can’t even begin to think of what they mean. That was once said by arguably the best investor of all time, Warren Buffett, and it couldn’t ring any more true. Investing isn’t hard. In fact, it’s quite easy. Anybody can simply open up a brokerage account and buy some of their favorite companies. The key to building a successful retirement portfolio is investing in the right things. That is where the difficulty lies. I’m writing this piece to show you a few ways that you can get started. I’m going to talk about two separate ways you can get started investing in this article, one of them requiring little to no effort at all, and one that will start you down a path you will be forever grateful you chose upon completing it. Let’s get started with the easy part. Investing can be a crucial part of your personal finances. Considering that almost everybody at one point or another, if they want to retire one day, will need to invest, there is absolutely no shortage of companies that will take on the task for you. Keep in mind though that nothing in life is free, and these methods of investing often come with a cost. This has been far and beyond the most popular investment vehicle people have decided to get involved with. So what exactly is a mutual fund? A mutual fund is simply a basket of stocks so to speak. You aren’t buying individual companies, you are buying into a fund that contains individual companies. Why are mutual funds so popular, and quite frankly, so damn handy? Well, first things first, it requires little to no involvement from the investor themselves. Mutual funds for most people are a simple set it and forget it option. Head into your bank, say you want to invest in a mutual fund, and they will do everything they can to set you up with the best portfolio possible. Prior to pulling all of my money out of mutual funds to head down the path of self directed investment, which we will speak about later on in the article, I barely checked my mutual funds. I simply opened up the annual report, seen my returns, and waited until next years report. But, mutual funds have been taking a lot of heat recently. This is due to the fact they are freaking expensive. The average MER (Management Expense Ratio) of a mutual fund is around 2.5%. Now, to someone who doesn’t know much about what you can expect to earn from the stock market, this doesn’t seem like much. But, in the grand scheme of things, it is a boatload of money. The average return of the stock market is around 7%. If a mutual fund is eating away 2.5% of your portfolio, that means it is taking over 35% of your yearly returns in fees. Over the course of your working career, this could amount to numbers in the 6 figures in terms of fees paid. However, that doesn’t mean mutual funds are terrible. They are a great item for a person looking to get started with investing that simply doesn’t have the time nor patience to learn the markets and manage their own money. If you’re looking to get started with mutual funds, simply book an appointment with your bank and see what they can do for you! Robo-Advisors are becoming exceptionally popular these days, and for good reason. Why? Well, for one, Robo-Advisor fees are drastically cheaper than mutual fund fees. Compared to a mutual funds MER of 2.5, you can expect to pay anywhere from 0.25-0.50% with a Robo-Advisor. How do they get away with charging so little? Robo-Advisors don’t invest in stocks. They invest in something called ETFs. I’m not going to go too in depth on what exactly an ETF is in this article, but the concept is very similar to a mutual fund. They contain a group of companies from a specific industry, all bundled into one investment. So for example, if you wanted to invest in the oil and gas industry, you could simply purchase an ETF that includes some of the biggest companies in the sector. When you purchase a mutual fund, you need someone managing the fund. This is because there is a constant need to monitor the fund and adjust the investments within it accordingly. You pay for this in two ways. One, you have to pay the person managing the fund, and secondly, you have to pay commissions as the fund buys and sells the stocks within it. With an ETF, there is no buying and selling within. The holdings in the ETF will always stay the same. You don’t need a manager constantly balancing the fund. When you sign up with a Robo-Advisor, they start off by taking you through a simple questionaire that will determine your risk tolerance. From there, they invest your money on what they believe to be investments that adhere to your tolerance. From there, they simply tweak and re-balance your portfolio as needed. It is literally a custom investment catered to your needs and philosophies. And the best part? These advisors are making returns that are just as good, if not better than mutual funds. Now that we have talked a little bit about some investment methods you can try out if you aren’t too keen on learning yourself, let’s dig into the awesome stuff. If you’ve decided to take control of your own finances and invest your own money, you’ve made an amazing decision. Not that either decision is bad, it’s just with me being a DIY investor, I think this one is way more exciting. Before we get started, let me note that there are a ton of ways you can invest your money. In fact, I published a great article on 55 ways to invest your cash here. But we’d be here until next week if I were to explain them all in this article. I’m going to go over the basics of what you need to do prior to beginning your investing career, and what you need to get it started. This is the number one mistake I see a ton of people who are just getting started make. Remember when I was talking about the average return of the stock market being 7%? Well, you can probably put two and two together that it may not be wise to invest your money when you have a credit card balance that is charging you 19.99%. You may feel like you are getting ahead because your investment account is growing, but you aren’t. You’re losing money! I always tell people who are just getting started to always have a chunk of money placed away for those uh-oh moments. A broken down car, a fridge that finally kicked the bucket. All of these mishaps can run you up quite a bit of money. The worst thing you can possibly do is pull invested money out of your brokerage account to pay for these situations. Why? Well, the stock market very finicky over the short term. Over the long term, it is a slam dunk in terms of capital appreciation. But when you are pulling money in and out of the stock market every 1, 3, or even 5 years, you are allowing short term fluctuations have a drastic effect on your investment returns. In a 3 year period, times have existed where the stock market has faced 25% or more swings in either direction. Having to pull your money out to pay for a new set of tires while the market is taking an absolute hammering is just setting you behind the 8 ball. When you invest money, invest money that you don’t ever plan to touch until it is supplementing your income in retirement. This is the number two mistake I see aspiring investors make. Jumping into the markets before they are ready. It’s absolutely crucial you attempt to digest every single piece of financial and investing knowledge that you can. When I first started out, I read a ton of books. I started out with a play account at Questrade and messed around with purchasing a bunch of stocks. I’d read a book, think I was a genius and make a bunch of investments in the practice account. It brought me down to earth pretty quickly, as I realized that reading a book or two and diving right in wasn’t going to get me anywhere. Knowledge of the stock market takes years. I’ve been a DIY investor for 8 now, and there is still so much I don’t know it makes my head hurt. That isn’t to say you need to commit to strictly learning for years prior to actually investing your money. The key is to be comfortable doing what you are doing. Start out investing in blue-chip dividend paying stocks. They don’t offer the wild returns I know you are thinking you are going to make right now, but they offer security and safety of principle. This seems to be pretty obvious, but it is the first step you need to take when you want to start investing. Like I said above, until you get comfortable, get a practice account. They will fund your account with play money and you can mess around buying and selling stocks with zero risk. When you are opening a brokerage account, you really need to think about what you want to achieve. Lots of discount brokerages like Questrade and Interactive Brokers offer extremely cheap commissions. This is because they provide absolutely no human interaction with your portfolio besides customer service. You are provided with research tools and a platform where you can buy and sell stocks. That is about where it begins and ends. If you’re looking to manage your own investments but may want a little help or some suggestions every now and then, you can head to a full service brokerage. Keep in mind that commissions and possibly even annual account fees are often substantially higher. Remember what I said at the start of the article about nothing in life being free? Doing research is absolutely crucial prior to opening a brokerage account as a lot of them have their benefits and their pitfalls. Some may appeal more to traders, while some to investors looking to dig into the fundamentals of a company. Buying your first official stock can be a challenging endeavor. There are hundreds of stocks available to choose from, how do you know which one is best for you? There really isn’t a simple answer. Diversification is the key to a successful investment portfolio so owning just one stock really is never a good thing. Try to pick 2 or 3 industries you are comfortable with and have at least some extra knowledge of how things operate. If you work for an oil company, you may have some knowledge on how the industry works and how certain commodities, like the price of oil, may have an effect on the stocks. 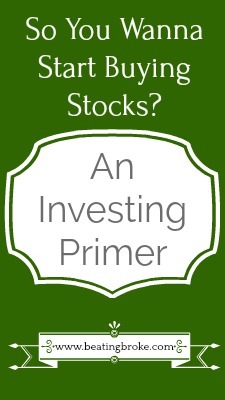 Another key element you need to decide on prior to purchasing a stock is what type of investor will you be? I consider the three main types of investing to be dividend, growth, and value. As a dividend investor, you’re looking for that developed industry leader who has seen it all. They aren’t too concerned about growth anymore, and are instead more concerned about pleasing shareholders in the form of a dividend. As a growth investor, you may be taking that up and coming stock in the industry that has high potential to overtake the industry leader. You get in at a cheap price, hold the stock for the foreseeable future and cash in during your later years. Keep in mind that this method of investing places substantially more risk on your portfolio than the value or dividend strategies. Value investing is a strategy that is used by investors who try to find stocks that are currently undervalued. Their stock price should be higher as you have calculated using methods I won’t go into during this piece, and you buy them knowing the market will eventually bring them back up. All in all, choosing whether to have someone else manage your investments or making them on your own is a win-win situation. This is because you are finally putting your money to work, towards a better financial future. I hope that I have given you at least some sort of foundation to begin your investing career. It’s a fun and frustrating process all at the same time. But in the end, you’ll give yourself a huge pat on the back when you finally quit your 9 to 5 and have some money to enjoy the things you love to do.